I just got home from setting up our Punic War mega game for the annual, two day Train & Hobby Show (photos to follow). Before leaving I walked around the hall, where, amongst others, there was a stand selling various second hand railway bits. I have been thinking about adding a train to our Mahdist games. Indeed, a game set in The Sudan will probably be next year's mega-game. Before long, I was the proud owner of what was described as a "typical colonial loco", a caboose & a flatcar & about 7 yards of track. The engine (which of course doesn't run) & cars will receive a suitable paint job. The track leaves me puzzled. It's typical model railway train track. My experience of real track is that it sits on a bed of gravel. Is this correct for The Sudan? How do I do this? Any advice from you Secret Model Railway Enthusiasts is welcome. Track is generally laid on (& in) ballast which acts to hold the track in place, as a drain & as a firm but flexible foundation. Sometimes for cheapness or for temporary lines it is laid directly onto the ground without ballast but that usually leads to significant problems of one sort or another. The old 'Ghan & North Australia lines were originally built without ballast & had a lot of difficulty with washouts from floods. Your problem is that unless you're permanently fixing the track in place, which is unlikely to be practical, then you need to either (1)ignore the ballast, or (2) put the track on a sub-base, add ballast to the base & use that as the 'building block' to make up the track formation. That of course assumes that you're not going to use the track for anything except static display/scenic purposes. It gets a whole lot more complicated if you're planning on making it workable! One reasonably easy way that might work (I haven't tried it myself) would be to use a card or MDF base, cover it with a suitably coarse grade of sandpaper. brushed a suitable ballast colour (anything from sand/dirt to gray to redbrown...)& put put the track section on that. It still won't look a lot like the real thing, as commercially bought track rarely does, (apart from anything else, the sleepers are usually wrongly spaced, often too short & the track gauge may not be suitable for the prototype) but will be a step up from the 'as bought' look. 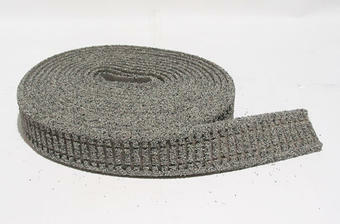 You can also get hold of track which has pre-moulded ballast attached! That resembles (slightly ) modern European railway practice, so might not be suitable either! is the real (Sudanese) thing. http://www.wikiwand.com/en/Rail_transport_in_Sudan It looks a lot like the old 'Ghan line! It's in regular use, judging by the polished railhead. Ballast, buy a tub of it, also brilliant basing material, you might want to mix the grades from fine to coarse. Then lay the track upside down, on the bottom of the sleepers place the stickiest gaffer/duct tape you can find. Turn it over, trim it to the area you want ballast in. Drop ballast onto the sticky part, press down, sweep off excess, fill in any gaps. The use a lightly watered down pva solution (add a drop or two of washing up liquid in the water first) and cover the ballast using a brush. Wipe down the rails to remove glue and ballast. Then once dry (and I am not kidding here) put a dag of tomato ketchup between thumb and forefinger and rub along the rails. wipe excess off the ballast but don't worry about red stains, they happen, and clean the very rail top back to shiny silver. Can second the recommendation of using ballast for basing works a treat. Is that for a layout? It's great if so, but it's a bit delicate for a wargames table where you're constantly picking it up & moving it around. Don't plan to use a railway that often so don't see it being an issue. If it does prove a problem I'll just fix it to mdf. Thanks for the many solutions. I'll think them over & choose what will work the best for me. You can 'set' foam underlay that NTM linked to with PVA glue. Brush PVA all over, add the track, allow to dry. 'Proper' ballasting that Fredd mentions is fine for fixed railway modelling (I was a railway modeller). getting it right's a bit of a ball ache though. If you have proprietary model railway track, paint it all Vallejo 822 German Black Brown or similar. Remove the paint from the top of the rails with a sanding block.